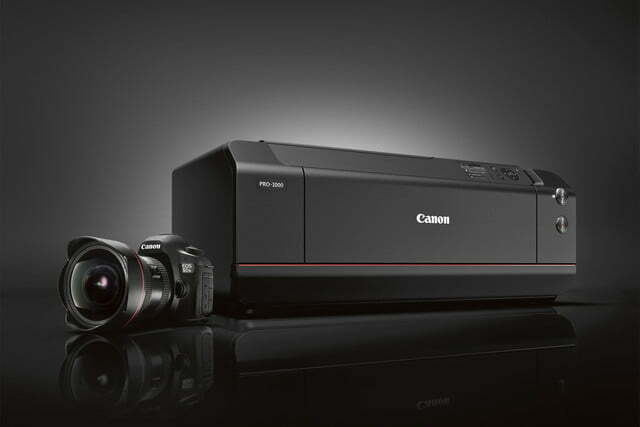 What’s most striking about Canon’s new large-format printer isn’t what’s inside, but it’s the new black exterior. It looks foreboding, considering its massive size, but the design is suppose to echo that of Canon’s DSLR cameras — down to the red line that marks the company’s EF L-series lenses. When we first saw it at Canon’s 2015 Expo (it was shown as a prototype with a “coming soon” designation), we thought it looked badass, if a bit Death Star-ish. The ImagePROGRAF PRO-1000 17-inch printer is the first of a new series of professional desktop printers. 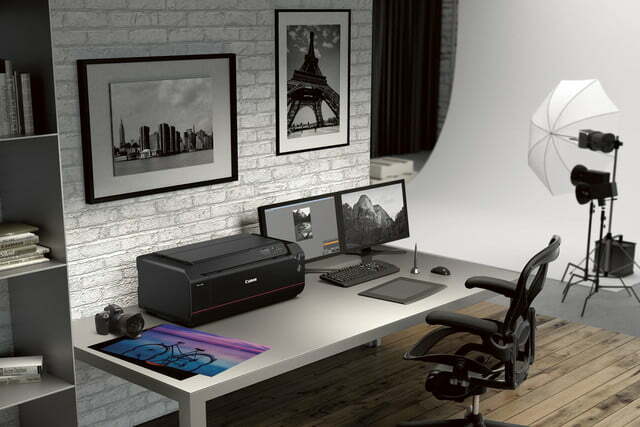 A step-up from the Pixma Pro-1 and ImagePROGRAF iPF5100, the PRO-1000 features all new specs, including the print head and ink system. 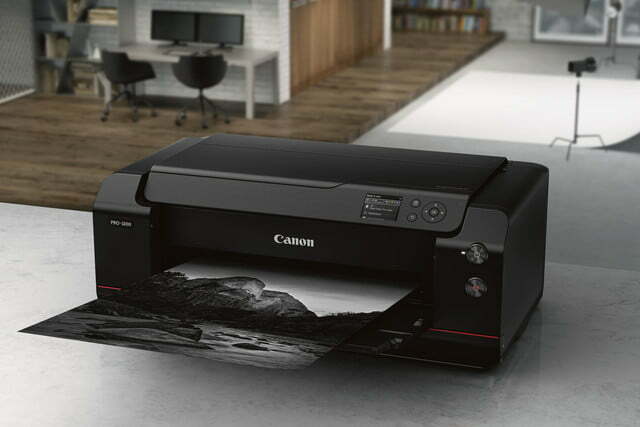 The printer is geared toward photographers, imaging professionals, schools, and anyone who requires high-quality prints or photos to be as exact as how the camera captured it. 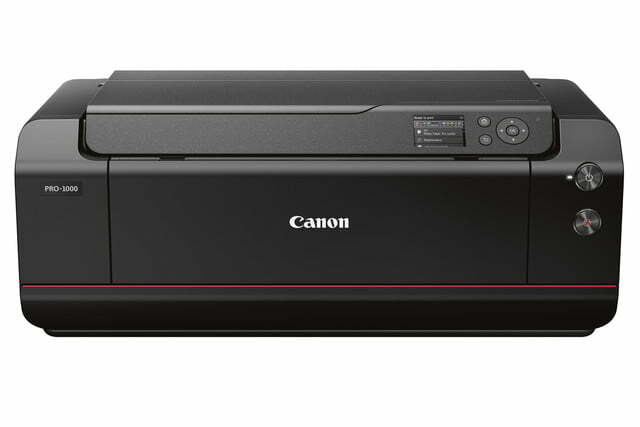 Canon also changed the way it designed this printer. A new processing engine “the balance of inks and the precise placement of ink droplets, carefully calculating best results for each print mode and media using various factors including color reproduction, tonal gradations, black density, graininess, glossiness, anti-bronzing and elimination of metamerism,” Canon says. With 1GB of memory, it can also handle more print jobs, faster. A two-way vacuum paper feeder “keeps media flat and even, helping with accuracy of ink ejection.” The printer has built-in color calibration for further accuracy. The new Lucia Pro 11-color pigment ink system and Chroma Optimizer (the coating that covers over the ink) creates deeper blacks while bringing out details in those dark areas. This could be beneficial to photographers who shoot in low light, using new cameras that can handle high ISOs. Photo black and matte black ink cartridges have their own nozzles, so there’s no need to swap them. The green ink has been eliminated to make room for the Chroma Optimizer. 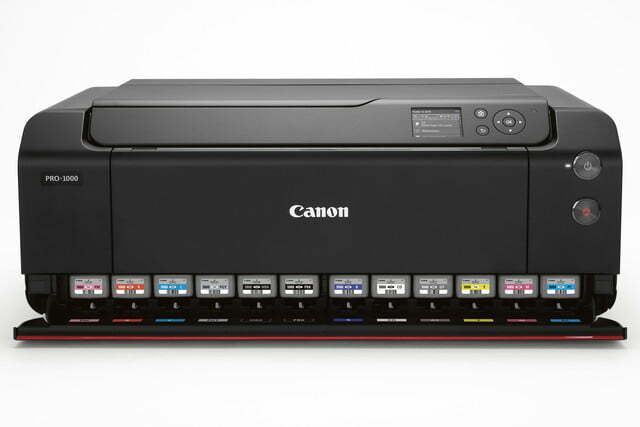 However, Canon says the system delivers true reproduction. Ink cartridges are also larger than previous models. On the software front, there’s a new plug-in, Print Studio Pro v 2.0, that works with Adobe Photoshop and Lightroom, as well as Canon’s Digital Photo Professional. “With 16-bit processing capabilities, fine details are dramatically improved, gradations are smooth and a highly accurate reproduction of the original captured image can be reproduced,” Canon says. Other software includes those for managing multiple printers, tracking supplies, and making other adjustments. The printer goes on sale at the end of the month for $1,300. The inks (photo black, matte black, gray, photo gray, red, blue, magenta, photo magenta, cyan, photo cyan, yellow) and Chroma Optimizer will each sell for $55.